Mitsubishi has finally released its Triton “urban sports pickup” truck in the Japanese market. Already on sale in Thailand (where it’s built), Europe, Australia, the Middle East, and many other global markets (but not the U.S.) the Triton has apparently been on Japanese customers’ wish lists for a while. Featuring clean, modern styling and the practicality that only a pickup truck can offer, the 5-seat Triton gets its go from a 176-horsepower, 3.5-liter gasoline V6. The sole transmission available will be a 4-speed automatic, and the truck features an “Easy Select” 4WD system that allows the driver to switch between 2WD and 4WD on the fly. The cabin gets blue-lit gauges, a large center storage console, and rear glass that can be lowered with the touch of a button. The cargo bed’s load limit is 400kg (881 lb), perfect for the kind of light duty Mitsubishi anticipates it being used for in Japan — primarily outdoor liesure activities such as watersports, mountain biking, etc. 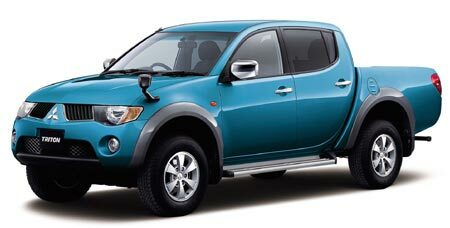 Tokyo, September 21, 2006 – Mitsubishi Motors Corporation (MMC) today announced the Japanese market launch of its Thailand built Triton urban sports pickup, priced at 2,940,000 yen including consumption tax and available from affiliated dealers throughout Japan. MMC started taking advance reservations on August 7 for the first 300 Tritons, and has already well received firm orders for 180 units. With the launch, further 300 units have been made available. Since debuting in Thailand in August 2005, Japanese customers have been longing for a Japan launch of Triton, with particular interests shown by enthusiasts of marine sports, winter sports, and other outdoor sports. User demand was further heightened by the fact that there had been no new model launches in the pickup segment since 2004, and by consistently high price for used pickup market in Japan. Triton is the only pickup sold as new in Japan by domestic manufacturers. Triton’s principal features are a stylish, sporty exterior not found in earlier pickups, a functional but comfortable interior, and in terms of function, a ladder frame body structure and suspension providing particularly good reliability and durability. Triton also provides a spacious cabin designed for back-seat comfort, enabling the vehicle to carry five adults without feeling cramped, but still having a cargo bed with freely usable utility space. Customers making advanced reservations were particularly attracted by the novel styling and by the cargo bed that makes Triton so flexible for outdoor and leisure purposes while still meeting the requirements of a commercial pickup. Triton has been selling well in Thailand and Europe, with a total of over 81,000 units being made in the first year or so (August 2005 to August 2006) since production started. Triton for the Japanese market is a four-door double cab 4WD pickup with a seating capacity for 5 passengers, powered by a 3.5-litter V6 gasoline engine mated to a 4-speed automatic transmission. * Triton offers unprecedentedly stylish and sporty exterior to a pickup. The purposeful front mask and strong side-view with large fender flares produce an impressively strong appearance, appropriate for the Mitsubishi stable, and with clear visual links to Pajero Evolution Dakar Rally car. * Exterior design features a parting line and roofline that appear to seem to cradle the cabin, combined with curved side lines for the cargo bed, creating fresh styling that retains its attraction over time. * A quality interior that combines both function and comfort includes advanced design in and around the instrument panel, with blue illumination for meters, a specially-designed steering wheel, a large floor console, and bucket seats in the front. The overall effect is to create a sporty but comfortable cabin. * Triton is fitted with a 3.5-litter V6 gasoline engine (maximum power: 131 kW (178 ps), maximum torque: 295 Nm (30.1 kgm)) that provides unstressed acceleration. It is particularly strong at low and middle speeds, giving powerful performance both on- and off-road. * The drivetrain includes an Easy Select 4WD transfer box that enables the driver to switch between 2WD and 4WD on the move. The rear differential is also equipped with a rear hybrid LSD to provide traction and driving stability on slippery surfaces. * The suspension is configured with double wishbones at the front for reliability and durability, and uses leaf springs at the rear. Each of these suspension setups has been further refined to enhance stability on-road and traction off-road. * The ladder frame design for the structure delivers the reliability and durability required for a sports pickup, while at the same time ensuring steering stability and a comfortable ride. * The length of the spacious cabin and other design features contribute to rear seat comfort, enabling Triton to carry five adult passengers without feeling cramped. * The freely usable utility space provided by the cargo bed with a 400 kg load limit can be utilized for a wide variety of purposes, including shopping or carrying camping gear, mountain bikes, or other equipment for outdoor pursuits.